Heaven’s Best Carpet Cleaning Mooresville NC offers carpet cleaning, rug cleaning, upholstery cleaning, and more! Our carpet cleaners give you the best value and we are confident that Heaven’s Best is the only carpet cleaning company you need. Call to talk to your local carpet cleaning technician to find out which cleaning service is best for you. They can answer your questions and schedule an appointment. 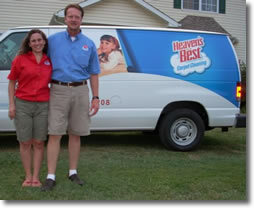 Mark & Donna Griffin live and operate their Heaven’s Best Franchise in Mooresville, NC. They have five children and are very active in the community and church. Mark served 13 yrs in the military, served in Desert Storm as a Sgt in the USMC and is use to Marine Corps white glove inspections. Mark believes in giving 110% in everything he does. Cleaning comes natural and he’ll clean your carpet, hardwoods or furniture like it’s his own. When you schedule your carpet cleaning, rug cleaning, or upholstery cleaning with us, we give you a quote up front. We tell you, the exact time we expect to arrive, and the amount of time we expect the job to take. Upon arrival our clean-cut, uniformed technicians will walk with you and review all spots, stains, and areas of concern that require extra attention. We listen to you let you know what results to expect. Before we start we review with you the exact price for the job. With Heaven’s Best Carpet Cleaners, you can expect great quality and value. Outstanding!! Mark came over to our house on a short notice and did an outstanding job on the carpets, he is very personable and professional. This is the 2nd time we've had him do the carpets and will continue to use his service. If you need carpets cleaned - he is your guy. Hi - Just wanted to say we were so pleased with your carpet cleaning! You got all of the stains and spots out! We will definitely be using you again! Thank you! My dog got extremely sick all over our carpet, and the smell was so bad, I thought we were going to have to stay at a hotel until we could get it cleaned. Mark gave us same-day service, and now our home smells great. He took care of the smell AND the stain, both for a GREAT price, and it was worth every penny!!! Very pleased with the service and finished product. My carpets looked new and dried very quickly. I was able to get scheduled with just a few days. Exceptional work. Will only use Heaven's Best in the future, others don't even compare. Carpet looks new and smells so fresh and clean, not like chemicals. Highly recommend! Mark did an amazing job! Very fast and was able to get all my daughter's makeup stains out of her carpet! So happy with the results!